We’re not sure what a “.5” model year is, but the latest iteration of the Nissan Rogue Sport is said to be a 2018.5. If the quest to comprehend this interstitial period requires slipping between dimensions of time and space, we’ve seen enough sci-fi television to know that usually leads to all kinds of trouble. Our SL test vehicle was equipped with the $1990 Premium Package, which adds a sunroof, automatic high-beam LED headlights, lane-departure warning, lane-keep assist, and automatic emergency braking with pedestrian detection. Those modifications begin with a revised grille to accept the radar and camera units necessary for the Sport’s Intelligent Around View vehicle-surroundings monitor, automatic emergency braking, and adaptive cruise control. The emergency braking, blind-spot warning, and rear cross-traffic alert become standard in all models, while the top-level SL adds the adaptive cruise control to its complement of standard equipment. There’s also a shift in the naming and content of option packages for the SL and mid-level SV. The Rogue Sport’s interior is among the most spacious in the subcompact-SUV segment. Among the SL model’s standard features are leather upholstery, a navigation system, around-view monitor, and heated front seats. CG had the chance to sample an updated SL with all-wheel drive, a vehicle that starts at $29,425 with delivery but was optioned up to $31,780. (The base price of front-wheel-drive versions is $1350 less.) In addition to the items previously mentioned, the SL comes with leather upholstery; heated front seats, leather-wrapped steering wheel, and outside mirrors; 8-way power driver’s seat with 2-way lumbar adjustment; “Divide-N-Hide” rear cargo-management system; keyless access and starting; remote engine starting; tilt/telescoping steering column; dual-zone automatic climate control; NissanConnect infotainment with mobile apps and services; navigation; voice command of audio and navigation systems; satellite radio and traffic information; 225/45R19 all-season tires on 19-inch alloy wheels; roof rails; and fog lights. The test vehicle also included the SL Premium Package. Built off content from what had been the first-year Rogue Sport’s SL Platinum Package, the $1900 Premium group tosses in a power sliding moonroof, LED headlights with high-beam assist, lane-departure warning, “Intelligent Lane Intervention,” and automatic emergency braking enhanced with pedestrian detection. The Rogue Sport offers 22.9 cubic feet of cargo space behind the rear seats, and 61.1 cu. ft. with the rear seat backs folded. Removable “Divide-N-Hide” panels can configured multiple ways for extra cargo-carrying versatility. The changes for 2018-and-change center on making the Sport a better value by more widely dispensing a number of safety and driving-assistance technologies, so driving dynamics have pretty much been left alone. However, by dint of its place in the vehicle-line pecking order, the SL is a bit cushier inside than the cloth-seat SV that Consumer Guide tried out in 2017. Padded surfaces cover the armrests, dash top, upper portion of the front doors, and sides of the console, relieving some of the hard plastic that’s widely dispersed throughout the cabin. There’s good comfort from the front seats, but rear seat backs feel kind of thin, and perhaps somewhat too upright for comfort on a long drive. Considering that the Rogue Sport is on the large side for a subcompact SUV, it has good interior room for the class. Front-row occupants enjoy a goodly amount of leg- and headroom. Rear legroom for two adults—maybe three skinny ones—isn’t bad—unless front passengers taller than six feet need extra legroom. Drivers enjoy generally good outward vision. 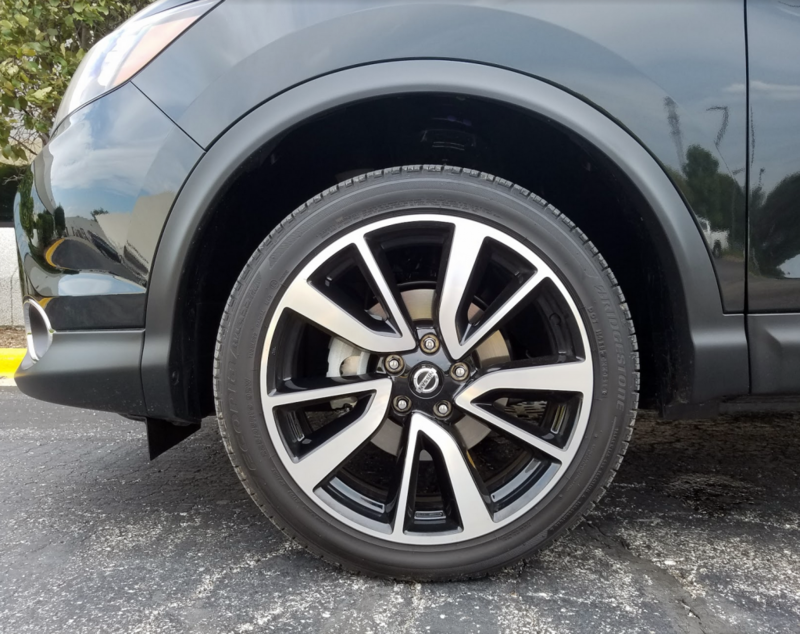 The SL model comes standard with 19-inch aluminum alloy wheels. The navigation and audio systems associated with NissanConnect come with a 7-inch color touchscreen. Radio tuning is done via buttons at the side, but stations are saved as presets with direct taps on the screen—all with a satisfying lack of fuss. Climate controls rely on convenient rotary dials to set temperatures, but buttons handle all other functions. Cabin storage for personal items begins with a fairly big glove box. There’s also a modestly sized covered console box, but it includes a small organizer for change or other diminutive items for which you might not want to have to fumble. USB, auxiliary, and power inputs reside in an open space under the dash at the front of the console. Two exposed cup holders are provided in the console, and pockets with bottle holders are in the front doors. Smaller pockets occupy the rear doors, and cup holders are fitted into the pull-down center armrest. Pouches attached to the backs of the front seats further serve rear passengers. The Rogue Sport also boasts a commendable amount of cargo room and versatility. A decent load of groceries or luggage will fit behind the second-row seats, and lowering the second-row seats expands cargo volume to 61.1 cubic feet. When the 60/40-split seats are down, they rest virtually flat, albeit with a slight gap between them and the cargo floor. The Divide-N-Hide components can be used to create storage tiers, make a hidden space under the bumper-height load floor, or be removed altogether to augment vertical cargo capacity. Bins for stashing small items rest in the corners just inside the tailgate. As for fuel economy, the EPA rates AWD Rogue Sports at 24 mpg in city driving, 30 mpg on the highway, and 27 combined. With much sustained hard running and just 25 percent city-type driving in 384 miles, this driver recorded 26.4 mpg. 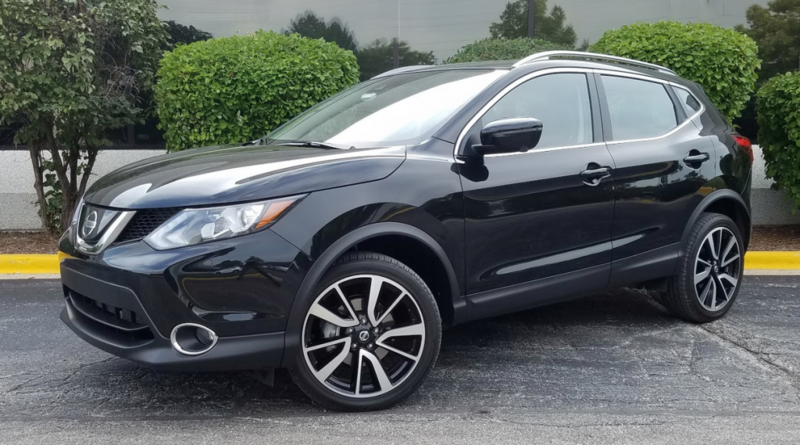 Though a few mpg short of the government highway projection, it bettered the 25.6 he got with a ’17 Rogue Sport that was closer to an even balance of city/highway driving. Handling is easy and predictable. Ride quality from the fully independent suspension holds up well against worn urban street surfaces, and is quite smooth on the open road. That’s what’s new for the half-a-new-year at Nissan. Get out the noisemakers and flip the calendar over to . . . July? 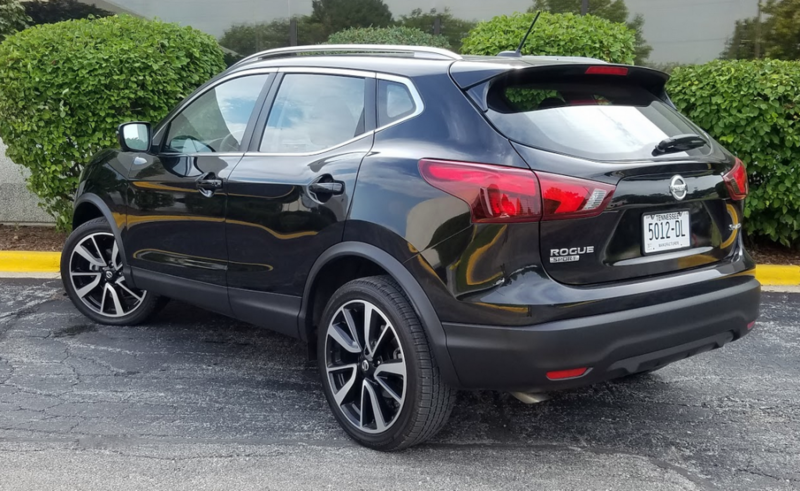 The Nissan Rogue Sport is an exceptionally well-rounded subcompact SUV that offers respectable dynamic performance, a spacious-for-the-class cabin, and a number of desirable available features. Written by: The Daily Drive staff on October 1, 2018.on February 15, 2019.